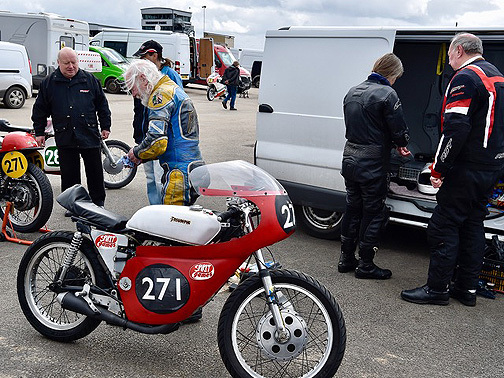 At the end of last season both the Cub and the Morini were going well, so we headed off to a test day at Mallory Park for a bit of fettling and to scrub in the new back tyre purchased at enormous expense for the Morini. There was nothing wrong with the old tyre except for having a medium compound which was a bit suspect in the wet – with a bit of luck the soft compound tyre will ensure warm and sunny weather for the whole year to everyone's delight albeit to the detriment of my likely results. Warm and sunny it was not at test day, being in March, but at least it didn't rain. And, unlike any occasion last year, both my and Jenny's Cubs survived the opening session! I had a go at tackling the Cub's front fork judder at full lean, and taking a bit of oil out seems to have helped; Jenny's bike developed an oil leak but that was swiftly sorted and she got some useful practice in. Turning to the Morini, I ran into a problem with it running very badly under full load so I could not test high speed handling, but the new footrests and gear lever felt comfortable. After checking that fuel starvation was not the culprit, attention was turned to the electrics. 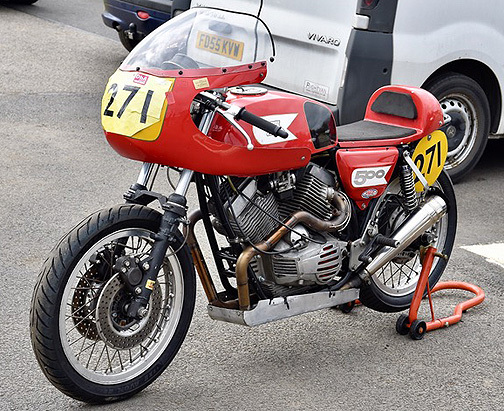 One spark plug indicated that the front cylinder was running a little weak and the plug was possibly objecting; new plugs were purchased but frustratingly the last session came to an end before they could be tried. 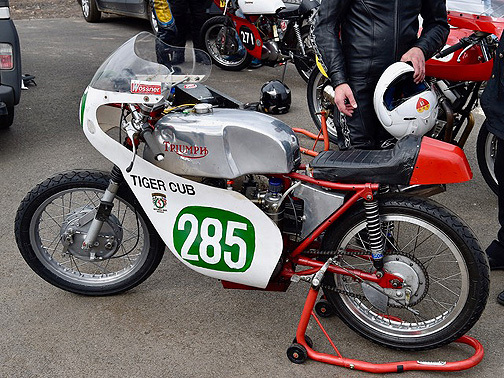 Back home in a warm workshop investigation revealed a loose carb rubber as well as an exhaust flange in grave need of attention, with a tightened clip and lots of exhaust gunge I am hopeful that the bike will behave itself at its first race – also at Mallory – in April. As a back-up, I have made a further attempt to sort out the gearbox problem on the Daytona. At least that can be tested on the road, preferably on a dry and tolerably warm day. I have just missed a couple of those, fingers crossed for one more before race day.